So yeah. A&E. Busiest hospital in London. Saturday night. In at 10:30pm, out at 3am. No break though, apparently, just beat the hell out of my hand. 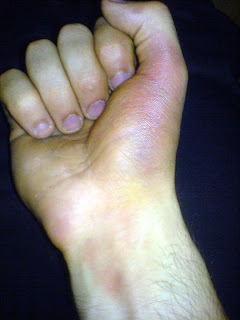 It's all about the all-over-palm-and-down-wrist bruising in 2008! Not being able to move your thumb fully isn't. Tim having to zip up my hoody for me in the middle of Waterloo station wasn't a highlight. I can ride again now though, and I celebrated by blowing up my freecoaster again. /\ This video of Nathan Williams and "That dude who whipped up that stairset" is pretty rad. Nathan Williams does something I've only ever seen Liam Fahy-Hampton do before, but he does it with a chain, so it's effectively a +1? Either way, nutso! Fit have a cool webvid up that features Mike Aitken talking about his new S3.5 frame, plus some riding footage. Whip!